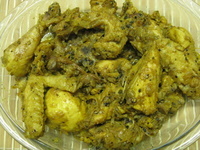 Pepper Chicken recipe is among very popular Indian chicken recipes. The pepper used in this recipe is not the bell pepper (capsicum) but coarsely crushed whole black peppercorns. The flavor is so unique that you have got to try this recipe at least once. Pepper chicken is a very easy Indian chicken recipe. Marinade the chicken in lime juice, turmeric, soy sauce and 1 tbsp of the ginger-garlic paste for at least 1 hour. In a pan heat oil and saute the onion till soft not colored, followed by ginger garlic paste and green chili. Now add the chicken and mix well. Saute the chicken on a high flame for 5 minutes, stirring in between. Add the salt and a sip of water and cook till chicken is done. If the chicken is small and tender it will get cooked fast but for a big and tough chicken, you can cover with a lid and simmer till done. The point is that the cooked chicken should be dry and not watery. Once almost done add the vinegar (little at a time). Sneak a taste and add more if required. Lastly, sprinkle the coarse pepper. Mix well and serve hot with rice. Tip :- To get the best flavor of pepper in this chicken recipe, do not use a electric or manual pepper mill. Instead use a pestle and mortar to very coarsely crush the pepper. You can also bash it up with a rolling pin. The amount of pepper you put is entirely a matter of taste. I suggest you add the pepper slowly, taste and add more if required.